56a. Pine-birch grass series of anthropogenic transformation. 96. Halophytic-forb (Halerpestes salsuginosa (Pallas ex Gejrgi) Greene, Iris biglumis Vahl. ), halophytic-gramineous (Achnatherum splendens (Trin.) Nevski) and sedge (Carex enervis C.A.M., C. duriuscula C.A.M.) meadows, in places with the inclusion of willow stands (Salix ledebouriana Traunv. ), on edges of solonchak depressions, lakes, terraces and along banks of steppe rivers and brooks with meadow-solonchak soils, combined with alkaligrass (Puccinellia tenuiflora (Griseb. ), Scribn. Et Merr., P. Hauptiana V.I.Krecz.) and saltwort (Salsola corniculata (C.A.Meyer) Bunge, s. str.) meadows on solonchaks, on bottoms of saline lowlands and around intermittent lakes with meadow-solonchak-like soils in the steppe and forest-steppe zones, predominantly in the east and in the central part of Mongolia. The map “Vegetation” is an overview-reference geobotanical map. 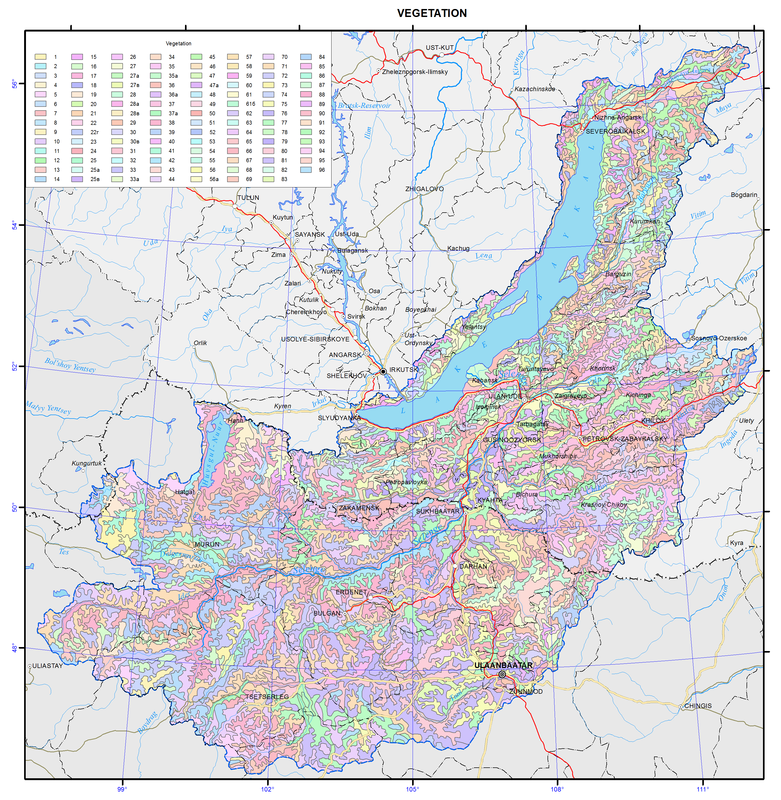 All available different-scale cartographic materials on the vegetation of southern East Siberia of the Russian Federation, literary and archival sources, and forest inventory data were used when compiling the map. For the territory of Northern Mongolia, basic cartographic and literary materials on the vegetation of this region of Central Asia were involved. For the entire area of the Baikal basin modern satellite images from the Internet resources (Google Earth) were used. Their processing was carried out with the use of GIS technologies. When creating the legend to the vegetation map of the Baikal region, well-tested geographical-genetic and structural-dynamic principles of a multi-dimensional and multi-stage vegetation classification, developed by Academician V.B. Sochava, were applied. Accordingly, the legend of the map has a multi-stage structure. All higher subdivisions of vegetation in the map legend are united by specific taxa of plant communities, typed according to the flora-coenotic and dynamic features of their structure. When typing an epitaxon principle was followed, according to which on the basis of structural-dynamic and topological similarity indigenous communities are joined together with derivatives into common epitaxa. The lowest unit of indigenous communities being mapped is a class-group of associations. On the total the map legend contains 96 numbers of epitaxa of indigenous and derivative vegetation. Each taxon singled out in the legend has a detailed floristic, structural-coenotic and ecological-topological characteristics. Due to the complexity of the spatial structure of the vegetation cover, combinations and complexes of plant communities, which are the most characteristic of a particular type of vegetation or area, are almost universally used. The highest level of the legend is formed by the following vegetation types: goletz (alpine), taiga (boreal) and steppe, communities of which form the modern vegetation cover of the Baikal basin. Each type of vegetation is presented by its set of communities of genetically close phratries of formations and their regional groups of formations. Taiga (boreal) vegetation covers the main areas of the Baikal basin both in the plains and high plateaus, and in the mountains, forming a mountain-taiga altitudinal belt and a belt of subgoletz sparse forests. According to the landscape features of the region, taiga (boreal) vegetation is represented in the legend and in the map by several groups of formations, namely: subgoletz sparse forests with thickets of shrubs, mostly of Siberian dwarf pine, mountain-taiga forests, piedmont-hollow forests, and forests of plains and plateaus. The first three groups represent an altitudinal-belt structure of vegetation of mountain ranges. Altitudinal-belt groups of formations of taiga (forest) vegetation are represented by communities of different origin and territorial confinedness. In the contact zones of the taiga and steppe (in the form of islands) vegetation forest-steppe complexes are formed; they are mostly of expositional-conditional nature. Southern warm and dry slopes of mountains and hills are occupied, as a rule, by steppe groups, while northern and eastern cold slopes are covered with forest taiga and in some places steppificated communities. In accordance with the terrain features, these complexes are represented by three groups, namely: mountain, of plains and plateaus, and piedmont ones. Steppe vegetation occupies large areas in the south of the Baikal basin and in northern Mongolia. Here there is an important biogeographical barrier that separates two large flora-coeno-genetic groups of western North Kazakhstan and eastern Central Asia steppes, representing Trans-Volga-Kazakhstan and Mongolian-Chinese phratries of formations, respectively. Two groups of formations are clearly distinguished; they are mountain steppes and steppes of foothills, elevated plains and hummocks. In each of them, large ecological-morphological groups – meadow and dry steppes – are distinguished according to the nature of steppe vegetation. For each of these groups within the respective phratries of formations independent regional steppe complexes are identified, namely: Southern Siberian, northern Mongolian and Central Asian formations. The main areas, both in the mountains and on the plains and hummocks, are occupied by dry steppes of the Mongolian-Chinese phratrie of formations. In general, the map reveals in details the spatial flora-coenotic structure of the vegetation cover of the Baikal basin in its evolutionary-genetic and dynamic dependence. Regional-geographical features of the coenotic diversity are well identified, taking into account their zonal-subzonal or altitudinal development conditions.